Robert McKeown was the son of William and Isabella McKeown. Robert was born about 1897 in Garvaghy, Errigal, Ballygawley, Co. Tyrone. 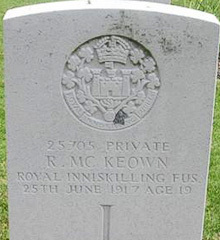 Robert McKeown enlisted in Omagh with the 9th Battalion of the Royal Inniskilling fusiliers. Private Robert McKeown was killed in action in France on 25th June 1917. Robert was 19 years old. Robert's older brother, Thomas McKeown, also died in the war. 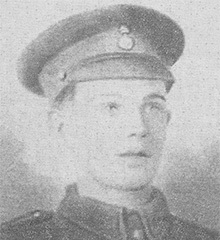 Thomas died 7 weeks later on 16 August 1917. Somer Farm Cemetery is located 6.5 Kms south of Ieper town centre on the Hollebekestraat, a road leading from the Rijselseweg (N365), connecting Ieper to Wijtschate and on to Armentieres.